Tropicals are hot, which might explain why The Garden Center Group’s Cool Product Awards judging committee featured the largest ever number of grower-retailers seeking out great new products at the Tropical Plants Industry Exposition (TPIE) in mid January. Collectively, the committee nominated more than 70 products from their searches on the show floor. In the end, committee members presented 15 companies with awards for their products. The 2019 TPIE Cool Product Awards is a collaboration between TPIE 2019, Florida Nursery Growers and Landscape Association (FNGLA), and The Garden Center Group. This year, A-ROO added even more styles and colors to this ultra light weight cover line. This cleverly designed plant stand from Avery Imports is three panels wide, hinged. Each panel features six planter slots (18 total). Slots include a waterproof liner. The special double-plus variegated bloom on this drought-tolerant succulent from Bill Moore & Co. is available bare-root. 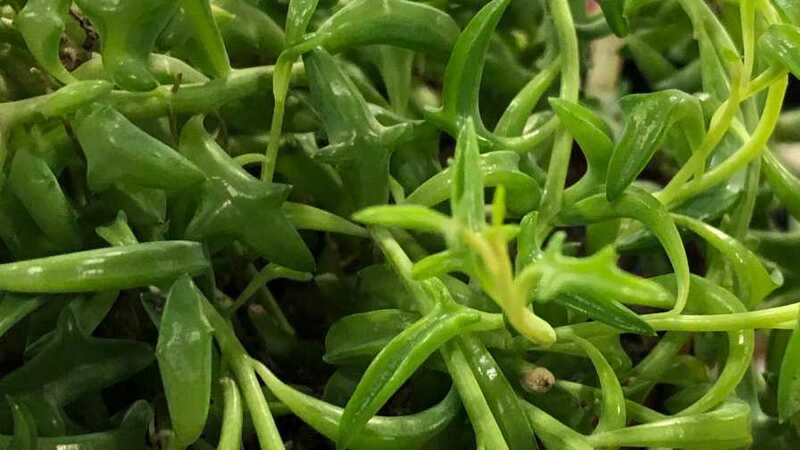 The new succulent Senecio Peregrinus from Branette Farms is actually a hybrid between Senecio Rowleyanus (string of pearls succulents) and Senecio Articulatus (the hot dog cactus). Its nickname was inspired by the fact that its cute little leaves look like dolphins leaping out from the water. This new kit from Coastal Nursery is the ultimate gift offering at Christmas for hostess gifts, teachers, parents, and more. The gift that keeps giving, this product is grab-and-go for the consumer, arriving to the retailer as a complete package from decorative ornaments and lights, down to the gift tag and bow. An alternate combination is available for Easter as well. Every year we expect Gail Cash of Flor-Design to reveal new creatives in her planted combinations. This year, she offers a new terrariums with battery-powered LED lighting. Strophanthus preussii ‘Medusa Flower’ is a curious flower from Greendale Nursery. Wild and unusual floral display arrives from late spring to fall on this shrubby climbing vine. It has clusters of cream-colored flowers bedecked with long, curly streamers and a rust-tinted throat. A host of new plant-container combinations were revealed with a JOY theme at LiveTrends Designs Group. Their message said, “We deliver JOY, by fusing nature, fashion, and art through unique living design.” There were many new combinations. Each unique gift package from The Magnolia Company contains a tree, along with its own set of care instructions, personalized gift card, and engraved ornament. Available with Magnolia and Olive varieties. This new biolor Cyclamen from Northland Floral is breathtaking and is available in four color combinations: Magenta, Bright Purple, Rose, and Salmon. You really have to see this in person to fully understand the striking color. Designed by Don Murray and Shibu Varughese at Polar Business Solutions, this is a fun, new alternative to the hanging basket. Available in two bright colors, the kit has bird body, beak, and tail feathers plus hanging chain. The combination of bright fun look and sturdy design was a real hit with the retail judges. Introducing another in the Hollywood Series, this hibiscus’ ultra-bright, gold-orange ruffled petals lead to a deep-burgundy center. A constant bloomer with full body of deep green foliage, ‘Rico Suave’ from Ramco Farm is a great addition to the landscape or patio. This year, Sun Bulb added even more combinations in Kokodama hanging planters and created two sizes of hanging displays for the retailer, making this an easy addition to your tropicals department. A variety of plant types are available along with several sizes of Kokodama planters. The introduction of Quicups from Temkin offers retailers creative options for brightening up small plant containers in multiple of materials. All feature a plastic liner. Styles are available with or without the raised rear tab allowing for both upright and cascading plant types. Custom printing of patterns is also available.